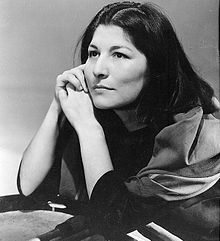 Mercedes Sosa, photograph by Annemarie Heinrich. Haydée Mercedes Sosa (9 July 1935 – 4 October 2009) was an Argentine singer. She was popular throughout Latin America and many countries outside the continent. Sosa became one of the important examples of nueva canción. She gave voice to songs written by both Brazilians and Cubans. She was best known as the "voice of the voiceless ones". Sosa suffered from breathing problems in later years. Sosa went into hospital in Buenos Aires on September 18, 2009. She died from multiple organ failure on October 4, 2009. She was aged 74. ↑ "Argentine folk icon Sosa dies at 74". Al Jazeera. 2009-10-04. Retrieved 2009-10-05. This page was last changed on 13 March 2017, at 16:58.